macadamistore has no other items for sale. 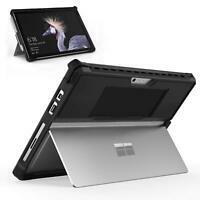 The Microsoft Surface is a useful device driven by a robust 2.4 GHz processor and running on Windows platform. The tablet is equipped with 64 GB memory storage. It also features a convenient 10.8-inch display that provides clear visuals. This Microsoft tablet supports Wi-Fi connectivity and lets its users wirelessly surf the Web, check e-mails, or stream videos. Furthermore, the Microsoft device has a built-in camera. Its weight is 1.37 lbs. The product is available in silver. Your item will be shipped same or next business day after cleared payment. Thank you! The Surface 3 is an underrated device. It is complete with flexibility, power, and functionality for the professional on the move. With that said, I am thoroughly happy with my purchase. The screen did not have scratches and came with a 30-day guarantee. A great device and experience overall. What more can I say--I would purchase again! I am usually wary of purchasing electronics online. This product exceeded my expectations because the product was as described. Very good battery life also. Really nice product. Looks and acts like new great value for the price. Very clean. Came with case, keyboard, charger, and all original packaging. 10/10.